There really is a Gold Beach. Well, come to think of it, there are prolly a lot of Gold Beaches in the world. The one I'm referring to is in the state of Oregon. We've enjoyed ourselves there many times. Our young son gathered up a lot of the beach in his swimwear and let me tell you, I didn't find any gold when I swept it out of the door of the camper! A simple shaker made with circle dies and gold and coral sandals. All the dies are from Lil' Inkers. The gold-embossed NBUS sediment is from Technique Tuesday's "Summer" stamp set. The gold fragments are from a kit that Papertrey Ink sold a few years back. The day was overcoast (haha, my typos karack me up), but just as I was taking my pictures, the sun broke through the clouds, reflecting off the acetate. It's the little things. If the card is standing upright, the gold looks like sand particles. Hopefully. Maybe. I also added a little bit of fine glitter. It looks like I did something really spongey and artistic with the shaker background, but before you give me all kina kudos for it, let me admit that it is just a snippet of pretty sunset pp I've had in my stash since the last century. CAS Mix Up May Card Challenge: Heat Embossing +. The Paper Players: A Sketch from Laurie. Pixie's Snippets Playground: Use your snippets! Thank you to all of you who have asked how I'm doing in your comments. I'm feeling much better, but still wasting a big chunk of each afternoon napping, so I'm sorry if I haven't gotten back to you individually. And not only that, what happened was the Mister turned on the PC and walked away for a minute and Windows 10 was downloaded before he could click an emphatic NO. He's my IT guy and he's been busy, but it will get sorted in a few days. (I'm not as nimble and quick on these here other deVices.) I appreciate those of you who have remained constant the last many months as it's been one thing after tother. Mwah! It gives me great joy to welcome these new friends and I'd like you to welcome them, too! Michelle Gleeson of Stampin' Mojo. Michelle began blogging in August 2013. She is an independent Stampin' Up demonstrator who showcases the product beautifully with her pretty cards and she's on the Design Team for Pals Paper Arts. In addition to her cards, Michelle does a marvelous job of capturing her memories in Project Life posts! Lynn B. of My Cards n Stuff. Lynn started blogging in 2010. She is a creative designer whose works of card art are often seen in challenge galleries. She also serves on design teams. I think her cards are so inspiring with their bright colors and happy images! Esther of Siesta Scrap (see Esther scrap!). Esther is from New Zealand and she started her blog in 2009. She doesn't post very often, but when she does, her work is a treat for the eyes. You will find cards, tags, scrapbook layouts, and some truly sensational 3D art projects that you just have to see to believe! Mouni Koneru of Craft Drama. Mounika has been blogging since June 2015. She is from Bangalore and a microbiologist by trade. Mounika has been paper crafting since 2013 and her beautiful and colorful cards have been rightly recognized in challenges. Her other hobbies include scrapbooking, fabric painting, recycling, and garment designing! A fabulous shaker card - love the sparkly gold and your lovely background paper. I was in the middle of typing an email when my computer decided to shut down and install Windows 10 (even though we had repeatedly said no) - anyway, it's done now and (fingers crossed) we don't seem to have any problems yet! Glad to hear you feeling a little better. You aren't the first person who has had Windows 10 download without you saying you want it. You can revert back, but I think you have a limited time to do it. Oh wow Darnell, that really is a beauty of a card, I love how the gold shimmers against the beautiful dp background! So glad to hear that you are feeling a little better - keep taking the naps dear lady, you need to keep your strength up for your big adventure! I got a pop up message yesterday saying that I am 'scheduled' for my Windows 10 update in two days time... I am pretty fed up saying no, so I guess I will just let the inevitable happen and then revert back if I don't like it (sigh). Love this shaker card, what a great design with the 'sand' mad flip flops. Take me to THIS beach, pretty please! Good to hear your health is improving, albeit still sleeping a lot. Gotta love the gold sparkle in your pretty shaker. Happy to hear you are feeling better. There's nothing wrong with taking naps in the afternoon. As a matter of fact, I could do with one right now, even though I've been up only a couple of hours. When DH was recovering after his operations, he always refused to take any naps, fearing that he wouldn't sleep at night. So I took them instead AND slept wonderfully at night. DH paid his last visit to the surgeon 2 weeks ago. He's not to come back and see him again unless it's for having a coffee together. As for Windows 10, I think you have 30 days to revert back to the old version. I took the plunge a few weeks ago and everything seems to be working fine. For me, the most important thing is that my work doesn't suffer from any technical issues. Kali Evdomada! Have a wonderful week! Hi Darnell, my wishes too for a speedy recovery for yourself and your computer. I love your gorgeous shaker card. It has a lovely warmth about it. The sandals are just darling. Happy creating. I love this! So fun and elegant at the same time Darnell! If only all that glittered WAS gold! But then, it'd be common as mud and then maybe mud would be more desirable....aaaah...who knows! You've been unwell? That is NOT good. Naps, however, are just the thing. I've got Windows 10. It's OK. Just takes forever and a day for my computer to start up. Every time. Aaaah well. Always time for a nap in there, too ;) Take care of you AND him!!!! What a fabulous shaker card Darnell! The 'gold' sand is wonderful and those little flip-flips are just too cute! I was reading the other day about a place in the Caribbean where the sand is pink - imagine that, I'd LOVE it!! An as for Windows - we threw it out ages ago and I now run totally on Linux Mint and love it! Sadly, Microsoft have such a grip on the industry they're almost holding Joe Public to random - with a product which no-one cares for :( Rant over!! That is one cool looking shaker, Darnell. You made the creative choice to put that pretty paper in the back of the shaker, so that makes you all kinds of artistic! So happy to hear you are feeling better than you have been. I'm sure your Hammy keeps you hopping and that's why you need your daily naps! Thanks for sharing this great card. Hugs! Your card is simply stunning and makes me want to get back to the beach, even though I was only there a week ago! You can see a snapshot from that day on my wordpress blog (https://creativethoughtfulness.wordpress.com). Love the gold glittery shaker scene. Makes me want to bury my toes on a beach somewhere. Glad to hear you're doing better Darnell, and I have to tell you that I quite like afternoon naps, so enjoy them while you can! And thanks for your comment about Windows 10...I didn't click "No" fast enough last week and am dealing with the mess now too! And I am NOT happy! I know I will figure it out in time, but until then it's driving me nuts! My biggest struggle is finding my photos that I just downloaded, and then when I do finally find them (never in the same place...grrrr! )I can't figure out how to rotate them! My hubby is the techie guy in our house too, but even he is struggling with this one! Oh well, good excuse to go take a nap! Take care Darnell...hope you're feeling up to speed soon!! so glad you showed a close up of the sunsetting paper -- it is a wonderful touch that really helps capture the beachy feel of this wonderful card. This is sooooooooooo fun! LOVING the sandals!!!!!!!!!!!!! Great dream of Summer, Darnell, I hope it's really on the way... :) This spring is very strange. Love the idea of your CAS-shaker (CASshaker? )and the gold fragments looks Wonderflly!!! Fab sandals, too! I'm glad you are feeling better and only one nap a day is good. I think we should all have one nap a day. I am loving those sandals and want a pair! Your card is just so pretty and sparkly. Gold has a way of making this card so elegant and the sunset paper is lovely. I hope I don't get 10 loaded if it is hard. I'm having enough trouble knowing what to do with what I have, and I don't know what that is. Nap on my sweet friend. A great CAS summercard! it's gorgeous! Darnell, this is AWESOME!! I love those sandals and all that glittery gold is so pretty. glad to read you are feeling better...keep taking your naps...you obviously need the rest. Oh sorry to hear aobut your computer...Marcia had the same thing happen...we are all struggling with finding things after windows 10!! good luck,..pass on any tips your husband has for finding pictures, moving them around etc!! It can be very frustrating!! What a beautiful sandy card. You shouldn't have confessed about the sunset background.. its so pretty.. I've not been to the Gold Beach in Oregon.. I'll have to check it out.. I have however had grand children's sand in the car.. house.. no camper.. but gees that stuff gets around.. Happy that the sun peeked out for you. Card came out great. I,' just loving those little sandals. I hate the ones that go between yer toesies so could I have a size 6 pleeeze! Hugs Mrs A. The important thing is that you're feeling better...that makes my day. This card also makes my day. Honestly, what you find in your stash is really impressive...the background (seriously thought you did that) and the golden sand, wow! Can almost feel it between my toes. However, if I had those flippy shoes on, I wouldn't want to ruin them on a sandy beach. Too pretty. Hi Darnell, so glad to hear you're feeling better and it's no waste to spend the afternoon napping 'cause I bet your brain is designing all sorts of fabulous cards ready for those eureka moments when Mojo does a vanishing act! Glad to hear you are feeling better, fatigue is such a drag. Let me know how Windows 10 works out I have been avoiding it like the plague! Love your gold beach shaker, would love to walk on a beach of gold with those pretty flippies! What pretty golden sand! Love, love, love your shaker card and the pretty sunset! Wish I could find some sandals like that! Thanks so much for sharing with us at CAS Mix Up! Beautiful gold shaker card Darnell. I also am glad to hear that you are feeling better. I've been struggling with W-10 for quite awhile now. Why can't they just leave things the way they were. Every time I just get used to one they go and change things again. I was just about to ask about artistic background on your golden beach. :-) But it still looks great. :-) You've created a wonderful, golden card. I love your cute shaker card. So glad to hear that you're feeling better. I'd love to be on that gold beach with the sunset in the background. I would even wear those flip flops because they don't have a post that separates out the big toe. It's sad when we have to say to each other, "Sorry about the upgrade." But it's true and our PC just did it to us a couple days ago too, grrrr. All that glitters IS gold here...what a fun creation! You are brave to make a shaker card with all the fine goldie stuff....but what an awesome final result! Since the sun is NOT shining here right now, I am basking in your card's golden rays! Thanks for sharing this with the Paper Players this week! It's amazing! Super fun with a sparkle of elegance thrown in!! Sorry about the computer woes, they sure can be a bother! What a fun and sparkly card! Love everything about it! So glad to hear you are feeling much better but don't look at naps as a waste of time - they are good! Take one for me please! Hope you continue to get stronger with each passing day, take card GF! 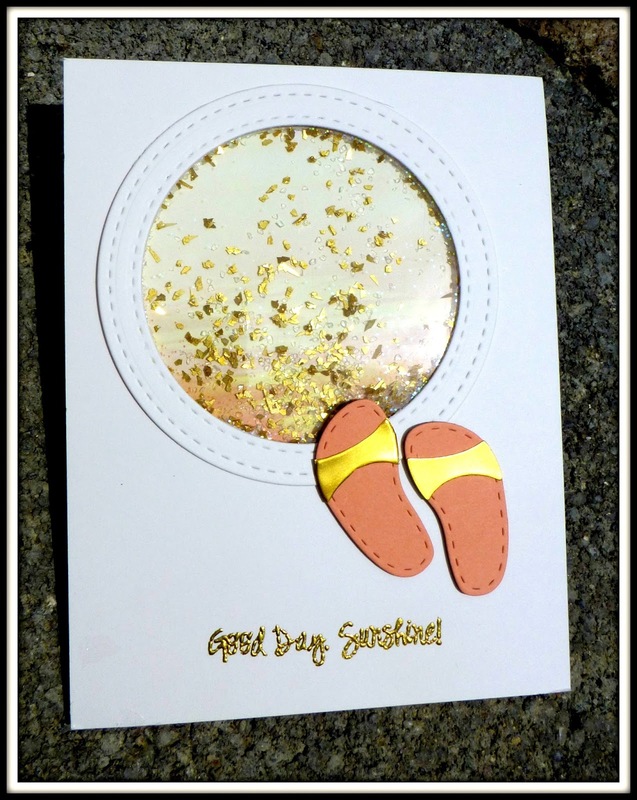 What a fun card and I LOVE those little sandals!!! So glad you're feeling better -- many more wishes and prayers for continuing on at journey! PS love the story of our son collecting sand in his shorts! I can only relate too well - HUGE sandbox right out my back door when we bought this house, I disassembled it personally!!! Love your little golden sand shaker, Darnell. Keep taking those naps...there's nothing wrong with a good nap. I'm partial to them myself! Ooooh! I'd love to visit a real gold beach ... maybe wear those cute mules too! Lovely card that makes me smile...I love the shades behind the gold ... such a pretty sunset. You know Napping is good for you ... should it happen when we meet I promise not to disturb you... Enjoy your day and get a Mac! Really cute shaker Darnell!I love that glittery gold and those fun flip flops.Thanks for joining us for the sketch challenge at The Paper Player this week, always fun to see your cards in the gallery! So simple and sweet!! I love the gold in the shaker and your sunset background is divine friend!! Great seeing you in the Playhouse! hope you are feeling wonderful! A really fantastic card. I have always found a mystique about shaker cards - they are really one of a kind. I love yous - Perfect just perfect! Love the gold stuff you have used too. I find that as I get older, it is harder to bounce back and I am also more content just to take it easy. Do what you can when you can and remember you only go around once. Do what makes you happy. If you don't want to cook - don't. If you don't want to make the bed don't. I you just want to sleep then sleep. Read some good books and escape in a good mystery or two. I love Anne Perry. Surround yourself with positive people and images. Fun and lovely card. Simple and stunning! Thanks for sharing such an awesome card. Beautiful card, Darnell!! Love the 'gold'! What a fabulously serene card Darnell, love it. What a fabulous card, Darnell! Love the gold flip flops and the glitter. The glitter really looks like sparkling water at sunset--thank you for joining us at The Paper Players! LOVE the gold and the coral sandals. Coral is right up there with turquoise for my favorite colors. The sparkle in this card is absolutely sensational. I'm sorry you haven't been feeling well. I hope you're doing better. Good luck with Windows 10! Absolutely brilliant, my friend! Love this shaker! Gold Beach is a little too far for us most of the time, but so fun it's a place we've both been! This is terrific! Love the gold sand and cute sandals- and that you used pp from the last century- because I have that too!! Great job with the sketch Darnell, Thanks for joining the Paper Players! This is soooooo cool! Yep - I noticed the background paper right off the hop and was sure that you had inked it up. This is such a clever and creative design idea! Never in a kazillion years would I have thunk to make a 'beach' shaker card...especially with the pair of flip-flops parked at the edge of the beach! Awesome card, Darnell! Love your gold specks inside the shaker, and the sandals are awesome. They look like a fancy pair of Birkenstocks and I think I want them! Thanks for playing along this week at The Paper Players, and I hope you feel better soon! So sunny and happy and shiny! And that patterned paper is perfect! I knew what Gold Beach you were talking about! :-) Awesome card, love the gold sand. WOW! I can see the golden beach ... and you made that I dreamed up. I love this card. Apologies for being behind in commenting on some of your cards. My oh my is this card clever. Way to go Irma. Shaker cards are intimidating for me but I do appreciate the work - I did make one. The gold, the sandals - perfecto. Oh wow!! I LOVE the gold in that beach card!! Kudos to you for pulling the pretty sunset paper out of your stash to use behind the gold. It looks fabulous!! I also like those flip flops. Such a great addition to this fabulous card!! Darnell - this is a gloriously fun and cool (in a really sparkly, shiny way) card!!! Makes me want to be on the beach ASAP - especially one close to you so I can meet MARVELOUS you! !